There’s been a lot of action around here lately. It’s been hot and muggy, and I’ve put in a lot of time dealing with the various pieces of crap still embedded in the corners of my property; pounds upon pounds of plastic sheeting in giant piles over what used to be the garden, long-lost, tangled piles of old chicken wire sunk beneath mounds of wet leaf litter and even car parts from a previous tenant all needed to be collected and added to the growing pile of junk that was to be hauled away. Frank, the handlebar-moustached junk man swung by with his big truck today, and I jumped in the bed to help load up all the crap. He kindly undercharged me for the huge haul, and soon he was pulling away down my long, winding driveway, leaving me a clean homestead for the very first time since I moved here, now almost six years ago. Finally, finally, my space was clear of every last item I didn’t want or need. The flower garden outside my door was looking trim and neat and the cut lawn stretched out, perfect, in all directions. A day or two before I’d managed to start up both the tiller and weed trimmer and had enjoyed the old, familiar smell of two cycle engine exhaust as I put the finishing touches on my place. Wow. Such a long time coming, but now it was here. 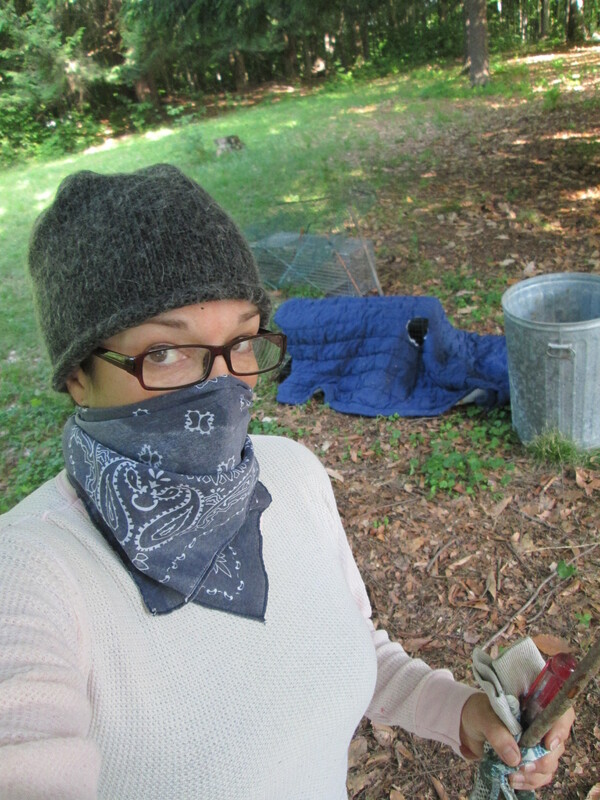 I sat on my steps, exhausted and surrounded by my chickens, and I reveled in the moment. A short time later, sweaty and covered in bug spray, I took off my grungy clothes and started the shower. No sooner had I done this, than I heard a car honk in my driveway. Wrapping a towel around me and running to the door I saw a woman get out of the car – the one who owned the lot through which my driveway runs for about fifteen feet – and she announced to me that she needed to finalize the plans for the driveway, as she had a sale that was to close the next day at one o’clock. Thankfully my somewhat compromised state allowed me a polite stay on the conversation. I promised to call her shortly. And I did. What ensued was the most civil yet heated exchange I have ever had with a person. She wanted to sell her property – but could not do so as my driveway went through it. She wanted to inform me that ‘first thing in the morning’ there would be a load of gravel dumped so that I would no longer have to cross over her property. I countered (not wanting the probably inevitable building of a house virtually on my driveway) by citing the easement we agreed on when we purchased the house; we bought the place with the right-of-way as part of the deal. She disagreed, but I told her that this was all a moot point – and simply hearsay – until we both had the deed in hand. Then she reiterated that tomorrow she would simply mark her property line with large rocks if need be. Man, she was a tough woman, and she remained eerily polite throughout. I am no negotiator, but I kept my cool and stuck to my guns. I believe she was calling my bluff, but nonetheless I won’t feel completely at ease until I’ve visited the town clerk’s office tomorrow morning and can learn the truth. She posited that my driveway might have ‘migrated’ over the years and that gravel would fill in the new driveway’s path – I pointed out that it was a well-constructed road, it had not ‘migrated’ at all, and furthermore a simple load of gravel would not be enough to move it. I suggested that the situation be remedied by my family simply buying the some 100 square feet in dispute on which my driveway sat. She told me this wouldn’t work, as that would leave her less than an acre, and that wasn’t enough to build on. Last time I checked, the zoning in town required five acres for a new house. So much for preserving the rural nature of our community. If holding out on this precious, tiny area meant staving off the development, if even for a little while, then I knew it was worth it. 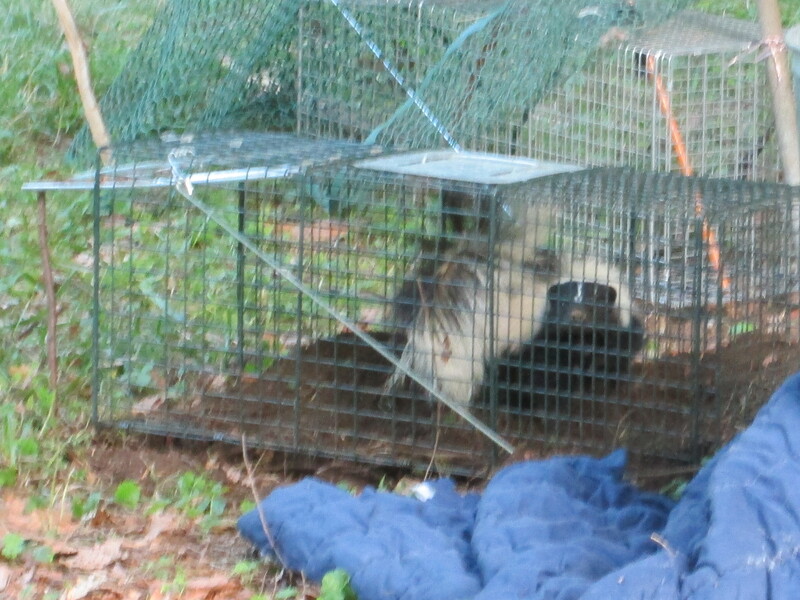 Yesterday, intending to catch a raccoon, I caught a skunk instead. 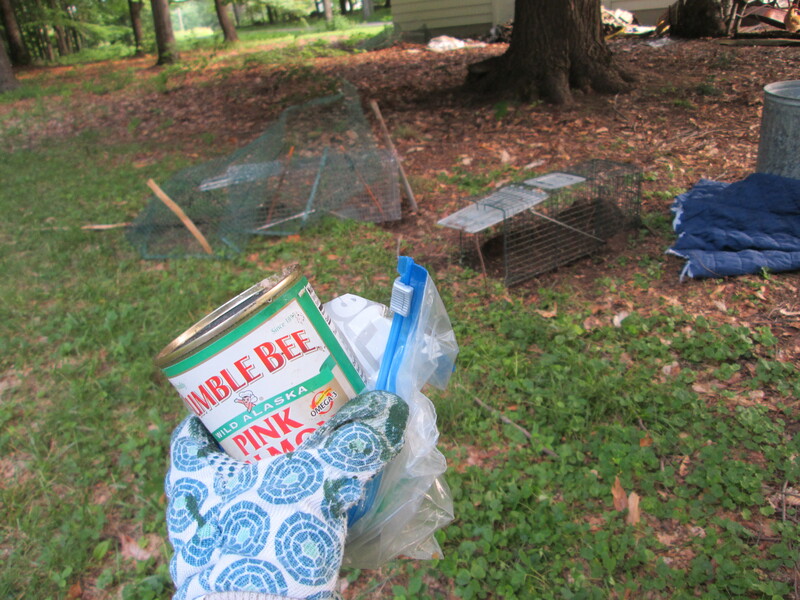 After my initial panic wore off, I spent a little time on YouTube educating myself on safely releasing the creature from the trap without getting sprayed. This event was truly a right of passage for me. This past week I’ve seen the death of two fatally trapped raccoons (sadly even had to whack one in the head to hasten his demise – that too was a strange initiation into real country life), I’ve shot my first gun, and I’ve taken out a dozen rodents in my house. I’m getting braver, but still, this took some new-found courage. It went well, and without incident. I pray for another such ending in this dicey new affair with the neighbors. It looks like our private little sanctuary in the country might be changing soon. And after finally getting the place cleaned up and looking like it should. Phooey. This is what really stinks. Not a terribly sharp image, but still you can see how beautiful she is. I was surprised at the amount of white on her – and what a tail. Got the cage oh-so-carefully draped in a cloth to calm her and reduce her vision. Suited up now and goin in! I managed to get the door open and propped up – but she wouldn’t leave. I ran inside to get some smelly canned salmon with which to entice her exit, but in the two minutes I was gone – she had left on her own. I’d wanted to watch her leave, but just as well. A good ending to a potentially stinky situation. Liz, I’m dedicating this song to you for many reasons… but mostly because you’re a winner. you’re a sweetie! what a nice little unexpected pick-me-up, thanks! let ya know how it all shakes out. 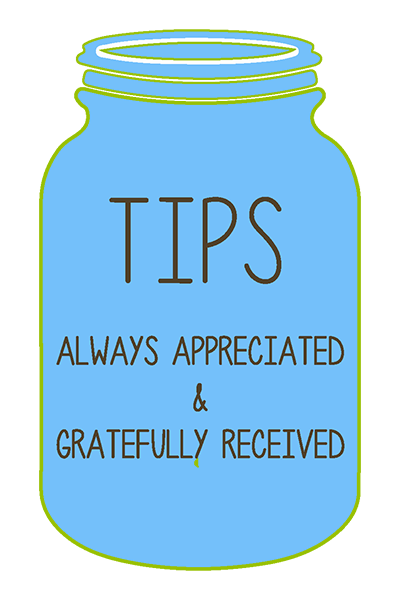 Thinking of you – not nice neighbours are just, well dissapointing – money does horrid things to people and no doubt is the driver behind someone trying to remove you from your right of way. Hopefully the council will have something helpful to say on the matter. Good luck and let us hope that the person buying the block of land is looking to write a more modern version of Walden and will simply blend in with the surroundings….we can always hope ey? 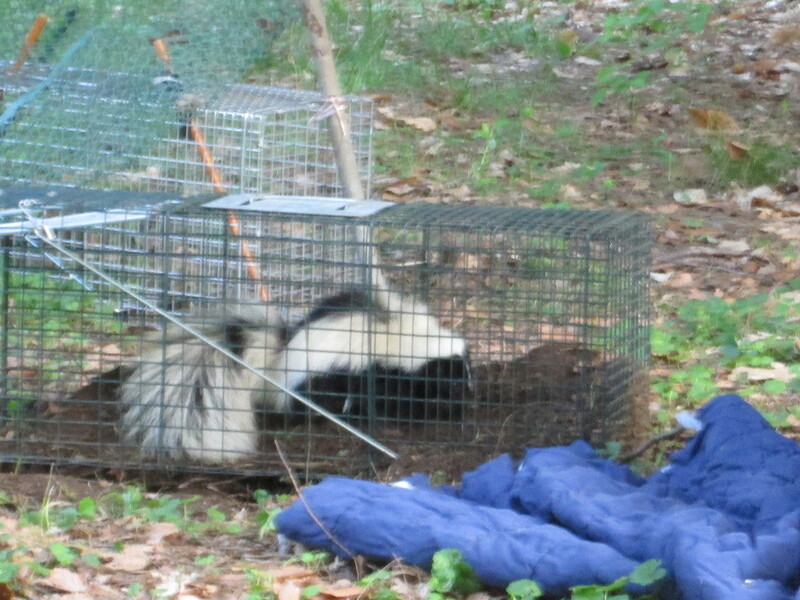 TC Oooh, thought it might make you smile that my four year old boy pointed to the picture of your Skunk and said – “oh wow what a nice little puppy doggie” – I advised him not to try and pat any dogs that resembled that one!!! !